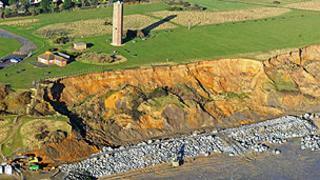 A £1.2m coastal erosion project to help preserve an area of crumbling Essex coastline has been completed. The 110m (361ft) Crag Walk has been built along The Naze in Walton to help protect the Site of Special Scientific Interest and Naze Tower from the sea. More than 16,000 tonnes of granite rock have been shipped in to build the walk, which will also include a viewing platform overlooking the cliffs. Residents have spent 25 years campaigning for the defences. It is expected the Crag Walk will slow the erosion to 20m (65.6ft) over the next 70 to 100 years, as opposed to the previous one to two metres each year. The work, which is part of the Naze Heritage Project, has been funded by the Naze Protection Society, Tendring District Council and Essex County Council. The society's chairman, David Gager, said it was a landmark moment. "The completion of this very significant project marks the beginning of a bright new future," he said. "The Naze Heritage Project will be delivering a range of initiatives to make the Naze a desirable destination for visitors." John Hall of the Essex Wildlife Trust, which manages a nature reserve at the Naze, added: "People will now be able to walk along this new rock structure at the base of the cliffs, learn about history, the fossils and the wildlife." "We are now able to move on to Phase Two and fundraise for improved visitor facilities that the Naze deserves." The project will be officially opened in June.